rredentia: Thesis Tracks, aptly named, was a thesis project of yours at Eckerd College. What degree were you pursuing with regard to this project? SevensVsEights: I received a degree in ‘Interdisciplinary Arts’, which is basically a liberal arts degree with a studio art focus. In my case it was centered around film studies (shooting and editing as well as film history) and sound design. Much of what I have read about Eckerd College has been very positive. What led you to this school? Are you still in school, and if so, what are you currently studying? Do you have plans to seek a profession in the music industry? I ended up at Eckerd almost by accident. I had applied to four colleges and was either rejected or wait-listed by all of them. I hurriedly applied to four more, most of which I knew little about except that they had a) a film studies program b) a philosophy program and c) they were small. Eckerd gave me a generous financial aid package so I went there. It ended up being a great school for me. I had the opportunity to run the radio station and book concerts for the campus. I graduated in 2009 and am no longer a student. I miraculously got a job as a videographer for the last two years until I was laid off in February. I am now living the life of an itinerant rock climber, living out of my truck and driving around the American west. I had my fill of office work for now and am more interested in getting a job outdoors. Maybe somewhere down the line I will pursue work in the music industry, but not for a few years. You briefly describe Thesis Tracks as being influenced by Oval. For those not familiar with the reference, could you go into a little more detail about how you made this music? 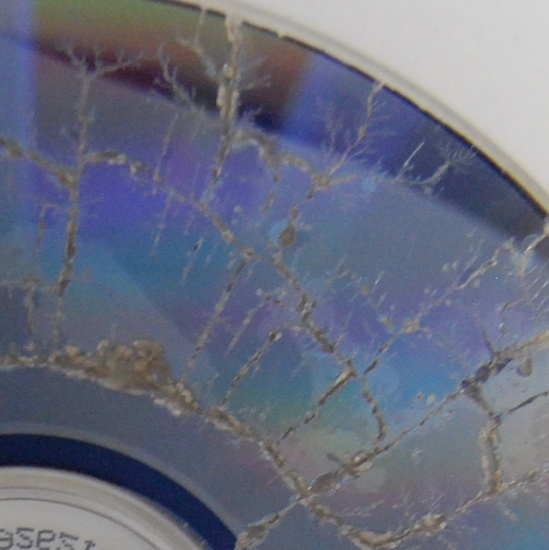 I unapologetically stole my starting point from Oval – sampling physically distorted and marred CDs. I burned a huge number of the same album and went about cutting, scratching, melting, and drawing on them all. I used knives, tape, all sorts of markers, the sun, and a microwave (this ruined the CDs past the point where any CD player would recognize them, but it produced the cover art for the album). About half were total failures, unreadable by my CD player. Of the other half, about half would produce some novel and interesting sound, from a fraction of a second clip to several minutes of slowly shifting percussive skips. I collected hundreds of these samples and fed them into Audacity and Ableton, layering them, adding some simple delay, feedback, panning, and equalization until I had a result I was satisfied with. I was a very experimental, playful process. Aside from the initial starting point, my process differs from that of Oval’s works, which I think is pretty evident listening to my tracks versus theirs. You can read my original artist statement and see some the discs that I used here. I think the focus in the press on Oval’s process has usually overshadowed what critics have to say about the music itself. Reading a description of your process, it’s very clear how influential Oval is to you, but this would not necessarily be obvious by merely listening to the music itself. Oval’s early music was sharp and angular-sounding, whereas Thesis Tracks owes more of a sonic debt to artists creating slighly less harsh drone ambient such asAsmus Tietchens and Thomas Köner. Procedurally, Thesis Tracks ends up having a lot in common with “glitch music”, but doesn’t necessarily sound that way. Was this a conscious goal? I didn’t really enter into this project with any conscious goals. After I had what I felt to be a solid base of samples I just started playing around with them. I didn’t want to force them to be anything they were not, if that makes any sense. I wanted each sample to keep a kind of integrity. Other than that I really just spent a long time moving them around inside of Audacity and Ableton until I produced something I liked. The primary source of samples ended up being Pantha Du Prince’s This Bliss. When I first listened to Thesis Tracks, I stopped after about a minute, and decided to listen to This Bliss first – an album I hadn’t listened to before then, though I had listened to his 2010 album Black Noise. Then I returned to Thesis Tracks. I wanted to do this, in part, because I felt I couldn’t apprecate Thesis Tracks properly until I was more aware of the context of its creation. Musically, there is not a real connection, and this was a real relief – not because This Bliss isn’t a good album, but because it meant that Thesis Tracks wasn’t a mere remix album, and was very original as a result. Was there a particular reason you chose This Bliss as a source, and what are your feelings about that album? Were there any other sources you used you’d care to mention? Every sample on the album is in some way from This Bliss. I started out trying to use many different sources, but somehow I could never make the tones match between two different albums. I just seemed to get the best material from This Bliss, so I threw the other discs aside an concentrated on just obtaining the most interesting sounds I could from this one album. Sources I discarded include Keith Fullerton Whitman’s Lisbon EP and Arvo Pärt’s Fratres. All three of these are favorites of mine, but I really can’t say what drove me to use them as source material. I just don’t remember my thoughts at the time. I remember my first CD player and how fragile it was. It would skip with at the slightest distress, and the first time I put a data CD in to hear what it would do, the result was alarming to put it very mildly. CD players are considerably more robust and error correction in even a $20 portable is a profound improvement to the best equipment available during the first couple of generations. I suspect that even finding a new audio CD player that would not know better than to try to play a data track as audio would be difficult. Did you have to resort to using older equipment in order to capture the basic sounds of failure? Exactly right. I managed to find a boxy CD played from the early 90’s that was not programmed to try and elide over scratches in the way that most modern players would do. I learned quite a bit about the physical construction of CDs and older players while working on the project. Would it be accurate to describe the creation of Thesis Tracks as experiment-driven? If so, could you describe an unexpected result which you were particularly happy with? I can’t really narrow it down to one happy accident because the way I designed my process the entire album is nothing but happy accidents. From the very start I was never sure what I was going to get off of any particular scratched disc, mostly I just hoped that I had damaged it enough to produce glitches, but not so much that it was unreadable. Once I had picked out a handful of samples I thought might meld together well it was another series of experiments until they took on some form or progression I felt happy with. Thesis Tracks lies comfortably between avant garde electronic minimalism and some of the more extreme barely-there minimalist music. What artist was your introduction to this style of music, and how did you become interested in it? Hmm, this is a hard one for me to answer. I would guess Brian Eno and Keith Fullerton Whitman as the artists who I stumbled upon first that really got me interested in sort of avant-garde ambient music. I was always extremely interested in music growing up, but living in the country I gleaned most of my information on new music from Rolling Stone and the BMG music catalog I got in the mail until I finally got the internet. From there my taste in music just exploded in all different directions, so it is very hard for me to pinpoint why or when I developed this line of musical inquiry. There’s an interview from about 1999 with Autechre – I can’t find it, unfortunately, so I’ll have to paraphrase. One of the duo observes that the popular music of the day is dictated by everything that came before it, which plays against the popular fortunes of experimental electronic music. If humanity had its musical memories and equipment wiped, and were presented with different styles of music, a lot of what we consider “experimental” would fare much better than it does now, because culture is informed so heavily by classical composition, rock, blues, folk, hip hop, and so forth. If this experiment were carried out and that memory wipe button were pressed, do you think popular music (or even music journalism) would be the better for it? Music is not produced in a cultural vacuum, so I don’t think any sort of scenario is remotely useful to think about. Culture dictates counter-culture. Have you written any music since Thesis Tracks? If so, is it available? Have you shopped this or any of your music to labels or other distributors? If so, what sort of response have you received? I have worked haphazardly on a few projects since this, but nothing I have been happy enough with to release. Making this into a project for school with a hard deadline was probably a real boon for my scattered attentions. I didn’t send it to any distributors, but I did send it out to a handful of music critics I respect. No responses, however. What music least like your own do you enjoy the most? I’d also like to use this space if I may to draw attention to Time and Temperature, my favorite current musician from my former hometown of Columbus. I forgot to ask you the most obvious question, the question that gets old right about the second time an artist gets interviewed: Why did you choose the name “∕∕∕”? I could pretend it was because it was vaguely evocative of how I was disfiguring the CDs or something, but really I just like using symbols to title things. No deeper meaning, look no further. I’ve enjoyed Thesis Tracks a great deal. I urge anyone interested in experimental and minimalist music to sit down with your music and give it a close listen. Thank you!